Willebrord Snellius, a sixteenth century C.E. Dutch astronomer, experimented with light passing through different media and theorized a relationship that has come to be known as Snell’s law. Snell’s law can be used to find the angle of refraction for light traveling between any two media. One important property of transparent substances is the index of refraction. As light passes between air (which has a relatively high speed of light and low index of refraction) and glass (which has a relatively lower speed of light and higher index of refraction), the light rays bend toward normal (perpendicular). Conversely, when light passes from the glass to the air, the light rays bend away from normal. Snell's Law provides an equation that describes how light is refracted when it travels from one medium to another. Specifically, the equation of Snell’s Law can be used to determine the size of the angle that refracted light bends. To determine the angle of refraction, one must first know the incident angle of the light and the two materials’ indices of refraction. 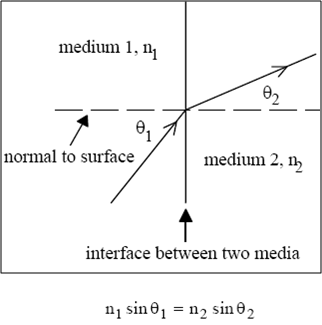 where n1 and n2 are the indices of refraction in medium 1 and medium 2, and the angles are measured with respect to the normal (the perpendicular) to the interface. The light is always bent more toward normal in material with the larger n, as the diagram to the left shows. Note that if the ray strikes the interface perpendicularly, at an angle of θ1 = 0°, then it is not refracted and exits perpendicularly with θ2 = 0°. Such a wave is reflected at the same angle as the incident wave because the two waves travel in the same material, and hence have the same velocities. Refraction happens at an interface or boundary because of the different velocities of the waves within the two materials. When a wave encounters a boundary between two materials, the portion of the wave in the second material will move faster or slower than the portion of the wave in the first material. Consequently, the wave will seem to bend. An interesting thing happens when light travels from a material with a higher index of refraction to a material with a lower index, as occurs when light moves from water to air. There is a certain angle where the light will not pass into the other material and will instead be reflected at the surface. This is called the critical angle of refraction. 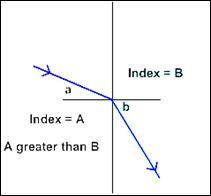 In the figure above, you can see that angle b is larger than angle a when index A is larger than index B. At some angle a, angle b will equal 90 degrees. Want to know more about Snell’s law? Click here to schedule a live session with an eAge eTutor!